Dangerous mountain passes and perilous waters imbue the landscape of Yilan with the feeling of a faraway land. Many people have traveled from far and wide to this place which bears the footprints of the Spanish, the Dutch, and the Japanese. Indigenous tribes that have settled Yilan include the Kavalan Ttribe who came by the sea and lived by the rivers, as well as the Atayal who crossed the Xiyuan Pass and settled in the mountains. Two hundred years ago, the Han (Chinese) finally summoned the courage to traverse the mountain range. Large populations began taming the wilderness, cultivating the fields and building irrigation channels. In essence, an entire way of life was moved here. Today, the Han comprise the majority of the population in Yilan. Before their arrival during the mid-Qing Dynasty, the area had been settled by the Kavalan Ttribe whose people speak an Austronesian language. They were the main inhabitants of the Lanyang Plain before the immigration of the Han, and most likely arrived in Yilan 1,000 years ago. Former names of Yilan include Kavalan, La-A-Lan, and E-A-Lan. Before the Han started cultivating the land, the Kavalans were the most privileged tribe to live on the plains. They were most likely joined by other Austronesian peoples that traveled from the southeast coast of the Asian continent, crossed the ocean and arrived in Taiwan. It is unclear how long it took them to migrate into Yilan. Kavalan settlements consisted of small villages along rivers, which were dubbed "the thirty-six communities of Kavalan" during the Qing dynasty. In reality, according to investigations by more recent historians, remnants of old Kavalan communities’number over forty. At the end of the eighteenth century, large numbers of Han people began moving onto the Lanyang Plain and used various means to seize land from the Kavalans. Some Kavalans left their homes, while some migrated southwards to the Hualien and Taitung coastlines and established settlements. The most important was Jialiyuan. The Atayal tribe arrived in Yilan approximately 250 years ago and settled along the upper Dazhuoshui River (now called the Heping River). Afterwards, the Atayal tribe crossed the Siyuan Pass to reach the valley upstream of the Zhuoshui River. These are the ancestors of the modern day Xitou Atayal peoples who reside in Datong Township. Another part of the Atayal tribe headed east to enter and settle along the Nan'ao North River and the Heping North River. They make up the Nan'ao group of the Atayal tribe and reside mainly in Nan'ao Township. Those residing south of Yingshi in Datong Township are the Gaogan group from Taoyuan. 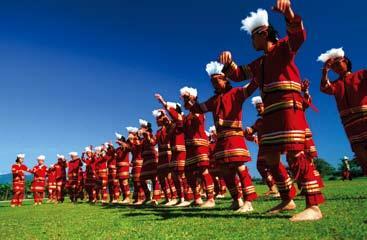 Non-Han peoples who migrated around Yilan region consist of more than just the aforementioned Austronesian peoples. With the discovery of new navigational routes, Europeans began arriving in Taiwan as early as the seventeenth century. In 1626 the Spanish led an invasion under the pretext of ship crews having been slain by Taiwanese "barbarians," torching harbors and surrounding villages, and even going so far as to take over Su'ao and establish a city named Saint Lorenzo. The Spanish were subsequently ousted by the Dutch, who had taken over the southern part of Taiwan. In 1640, the Dutch began contracting Han merchants for trade and levying taxes on various commercial goods, including daily commodities. The merchants had to pay all company taxes but also enjoyed the right to monopolize trade. This system persisted through the Kingdom of Tungning up untill the beginning of the Qing Dynasty. Perhaps as early as the seventeenth century, quite a few Han who spoke the Kavalan language traveled between Taipei and Yilan in order to undertake such trade and collect taxes. The earliest records of the Yilan population were those maintained by the Dutch government for purposes of governing and tax collection,. Although somewhat cursory, the records indicate the Kavalan tribe established forty-four to fifty settlements on the plains and numbered approximately ten thousand persons.